Tired of obscure tables of temperature anomalies and confusing maps of summer sea ice volumes? Here's a simple chart that ordinary Americans can relate to - the proportion of record highs to record lows at individual US weather stations since the 1950s. 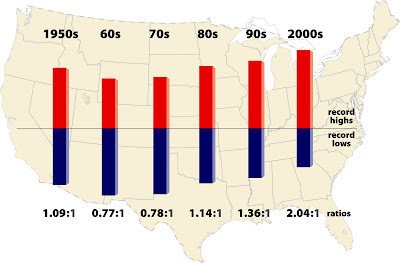 2009 National Center for Atmospheric Research study of 1,800 weather stations in the 48 contiguous United States over the past six decades (see Record high temperatures far outpace record lows across U.S.
What a kafuffle about the withdrawn 10:10 videos!